Now you can make your conference room or classroom an interactive learning environment without the cost or complication of installing an electronic whiteboard. 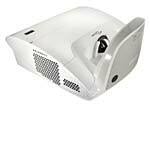 The Optoma TX665UTi-3D, an XGA ultra short-throw multimedia projector with interactive 3D function, upgrades plain whiteboards and screens (or even a bare wall) into an immersive learning experience. The high-performance projector and pen combination integrates the features that educators and business presenters need to meet today's day-to-day demands and tomorrow's emerging technologies. With high brightness, contrast and sharpness, the TX665UTi-3D engages the audience by producing crystal clear images that keep audiences connected. The ultra short-throw design minimizes shadows, while the sleek styling hides cables from view. This fully-loaded projector delivers an all-in-one solution that meets your needs.